Also known as the “Breakfast of Champions Sampler”, our BCP Coffee Break Sampler is chock-full of perfect smokes to enjoy with a fine cup o’ joe. 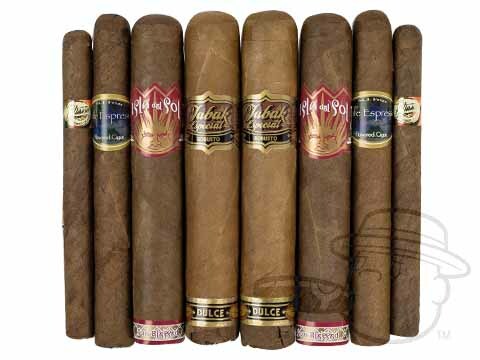 Showcasing 8 handmade coffee-infused cigars from Tabak Especial, Isla del Sol, Cojimar, and our own BCP Flavors, this sweet and savory sampler will make your morning shine with eye-opening flavor. These are very flavorful and good burning cigars. I'm a huge Tabak fan and keep trying other coffee infused cigars and would recommend this sampler to anyone wanting a good variety of coffee flavors. If you like sweet and smooth, this is it. Cafe Espresso by mj frias really did it right by this tasty and consistently fine smoke. Highly recommend this BCP flavor cigar. Wish they weren’t out of stock; I’d purchase more boxes. Bcp Coffee Break Sampler is rated 4.3 out of 5 based on 15 customer ratings. Of the Bcp sampler, which are mild? These cigars are all mild.